Plants that grow in medium light are the perfect plant. They like light, so bright light is good, but not direct light. They’re good to go near a west or southeast window. Keep reading to find out more about what indoor plants do well in medium light conditions. African violet – The African violet (Saintpaulia) is your classic indoor plant. It blooms like crazy for some people and never for others. This is a good plant to experiment with. It has fuzzy leaves that form a rosette, and the flowers come in a variety of pink and purple shades. It likes average to warm temperatures along with medium to high humidity. The soil should be kept evenly moist, but you should not get water on the leaves. The plants should be fertilized with diluted fertilizer each time you water. Begonia – The begonia is a colorful plant. It has varied foliage and showy flowers. The ones with the large flowers (tuberous or Rieger begonias) are disposable. Longer-lasting flowers include the angel wing (has spotted leaves and little flowers), Rex (have variegated foliage), and B. schmidtiana (dark green crinkled leaves). Begonias like average temperatures and evenly moist soil. They require light fertilization, more regularly during growing season. One thing about begonias is that if you grow bedding begonias outdoors during the summer, you can pot them and bring them in for the winter. Just keep them by a sunny window. Bird’s nest fern – Bird’s nest fern (Asplenium nidus) has apple-green fronds that get to be 3 feet long. This is a great plant for the bathroom. It likes high humidity and average temperatures. The soil should be kept evenly moist. This plant grows somewhat slowly. Boston fern – The Boston fern (Nephrolepis bostoniensis) is a popular houseplant. It’s a tropical looking plant that is full and lush when it’s kept nice. The Dallas fern (N. exaltata Dallasi) is shorter and dense. Fluffy Ruffles has frilly fronds. You need to provide average temperatures and evenly moist soil for these to flourish. Christmas cactus – The Christmas cactus (Schlumbergera) has a name that comes from the bloom. The flowers are pink and red with bent back petals. Depending on when it decides to bloom, it is sometimes called the Halloween cactus or the Thanksgiving cactus. There is even an Easter cactus. They like average to warm temperatures, but you should let the soil dry out between waterings. It takes less water during the winter. Croton – The croton (Codiaeum variegatum) is a nice plant with orange, yellow or red ribs on the leaves that make it look like it was dipped in paint. It likes medium to warm temperatures and high humidity. Dumb cane – The dumb cane (Dieffenbachia) is another easygoing plant for your home. They have white and green variegated leaves and can grow to be 3 feet tall. They like average temperatures and medium to high humidity. The soil should dry out between waterings. Moon Valley pilea – This member of the Pilea genus, also known as aluminum plants, has dark veined leaves and looks like it’s quilted. It grows pretty fast. It likes cool to warm temperatures and high humidity. 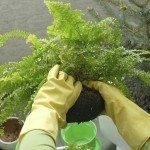 The soil should be dry between waterings and you should pinch it back to keep it bushy. Moth orchid – The moth orchid (Phalaenopsis) is the easiest orchid to raise. That really doesn’t say much though, because everyone knows orchids are difficult plants. There are a lot of flower shades and one stem that blooms can last 18 months. This plant likes warm days and cool nights. You should never overwater the plant and remember to fertilize it once a month all year with orchid fertilizer.